A while back I created some effect strips for 360 video in Blender[a]. Unfortunately, Blender's video sequence editor has no support for plugins, so the only way to get the effects really integrated would be to get my effect strips merged with the main Blender tree. This was too much work, so I decided to go look for some other video editor - one with plugin support - and I came across Shotcut[b]. Shotcut's plugin support is much better than Blender's, and while the compositing features in Shotcut lags Blender's, it's much more of a proper video editor. The source is available at Bitbucket[c]. The software is offered under the GPL 2.0 License[d], which, to quote the all-caps section of the license, means that THE ENTIRE RISK AS TO THE QUALITY AND PERFORMANCE OF THE PROGRAM IS WITH YOU. The same warning as above - but with the added caveat that this I developed all this on Windows, so this is even more experimental and also lacks OpenMP support, making it substantially slower than the Windows version. Go to bigsh0t at Bitbucket[e] for an explanation of how the plugins work. Hemispherical to Equirectangular: Converts a video frame with two hemispherical images to a single equirectangular frame. Equirectangular to Rectilinear: Converts an equirectangular frame (panoramic) to a rectilinear frame (what you're used to seeing). Can be used to preview what will be shown in a 360 video viewer. Transform 360: Rotates a panoramic image. Equirectangular Mask: Adds a black matte to the frame. Use this if you filmed using a 360 camera but only want to use part of the 360 image - for example if you and the film crew occupy the 90 degrees behind the camera. Rectilinear to Equirectangular: Converts a rectilinear (a normal-looking) image to an equirectangular image. 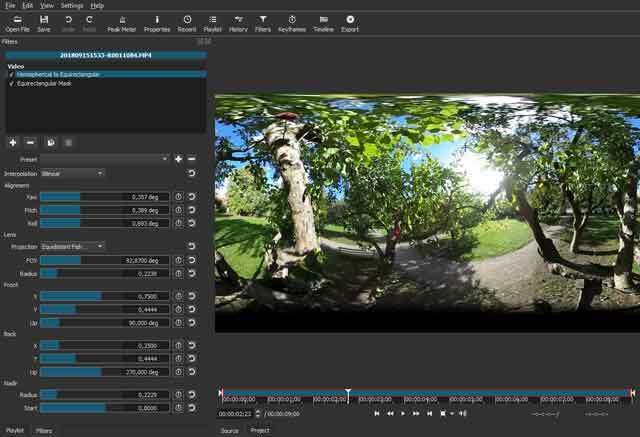 Use this together with Transform 360 to place "normal" footage in a 360 movie.